We have had a family tradition of baking cakes on the solstices for many years. At the summer solstice we bake the cake for the daoine sidhe and Aine, who may be a fairy queen or may be a goddess; and at the winter solstice we bake a cake for the Sun's birthday. In previous years with a more recon based approach we would bake the summer cake and leave pieces as offerings but otherwise we didn't do too much to mark the day. From an eclectic Wiccan perspective I would have done a full circle to the Lord and Lady of summer, the God and Goddess of the Greenwood. Last year I did a public ritual in a more neo-pagan/Wiccan style that honored the fairies, spirits of the land, and Lord and Lady - this ritual will go down in infamy for the disapproval that resulted from some people* so I may be a little gun shy about jumping right in to do something similar again, despite its overall success. In the end I settled on a hybrid compromise, which is, perhaps, the best approach anyway. Combining holiday fun with necessity I gave the gift of new summer shoes to the girls (and my husband) something I might keep as a tradition in the future. 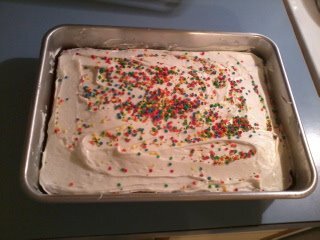 We baked a vanilla cake with butter cream frosting and the girls decorated it with candy sprinkles from the store. The cake came out very nicely, and after dinner when everything was ready we sang a Jana Runnall's song called "Graine" that I learned from Kellianna; then I cut a piece of cake for the fairies and another for Aine. The cake was left outside by our little Hawthorn tree and then we went back in and enjoyed some cake ourselves. I read the girls a book about the Summer Solstice by Ellen Jackson that includes folklore and traditions from around the world. Later that night I had my own ritual, more along the lines of a Wiccan circle. Perhaps next year I can find an even better way to celebrate everything together; maybe I will finally get over my feelings of Midsummer inadequacy. But this year went well anyway, it was fun, the girls enjoyed it, and the fairies got their cake. In a large bowl, cream butter until light and fluffy. Beat in the confectioners' sugar, vanilla and enough milk to achieve desired consistency. * Long, messy backstory. Shortest possible version is that what one person feels is an acceptable offering may not be seen as such by others. Also I am a tangental ritual leader and not everyone likes my style of ritual. Lesson learned the hard way. Whose lesson..? I doubt you had needed to learn one, and I suspect the lesson was actually needed by someone else. A offering comes from the person and from their heart, and must not be “edited” by another. Well, I'm sure its safe to say that there was more than one lesson there to be learned. I am glad to know now though that some people do always see a need for tangible offerings - as opposed to what was offered at that ritual, which was song, laughter, and energy raised and given. I also needed to know that while I am perfectly comfortable in a casual, organic ritual that has its own flow and rhythm, other people want rigidly set structure and silent reverence. I accept now that it is not in my nature to show reverence without mirth, or to worship without joy. What I struggle with is the sting of knowing at that ritual I failed other people, I led them where they did not want to go and left them feeling that the experience was a bad one; that what fulfills me offends them. Leading public ritual is hard for me now, because of that (and to be fair this wasn't just anyone, this was someone I loved and trusted like a sister and the whole situation was very ugly the way it went down). But life goes on and in the end I'm glad I know myself better now because of all of that. Agree with Eilidh! Morgan, I think your biggest hurdle is to quit worrying about what others think or how they "appraise" you. Bottom line? It just doesn't matter! You are strong. You are magickal. You need only worry about your own perceptions and self-reviews-- no one else's should weigh in. Only you can make this leap and until you make it, one foot will stay nailed to the floor (which is why we go in circles...). Spoken by friend and elder-in-years, Sue/Moonwriter. P.S. Love the cake! you are probably right, and I am tired of going in circles.